Creating a simple yeast starter as outlined here at brewersfriend.com will greatly increase your yeast cell count, but there is a way to easily supercharge this process. By using a stir plate you will be able to grow nearly 100% more yeast cells using the same volume of starter in the same amount of time. Basically, for the same investment in yeast, time and starter liquid, you will be able to double your yeast production with a stir plate. Ideally, boil the starter wort in the flask that you will be using to create the starter, this will help to sanitize the flask. DO NOT use an airlock on a stir plate starter as it will impede the ability of the stir plate to exchange CO2 from the fermentation for O2, which will help grow yeast. DO use foil to cover the top of the flask instead of an airlock. Ferment the starter at 75F – 80F. While not optimal for flavor production, you are trying to grow yeast, and warmer temperatures will accelerate this process. By doing the above, you are creating the perfect growing environment for your yeast cells, allowing them to grow at a much greater rate than they would with the use of a simple starter with no stir plate. After the starter has fermented out completely (approx 24 hours), remove the starter from the stir plate and chill so that the yeast may settle. After a short period of time (several hours), the yeast will form a nice thick slurry in the bottom of the flask, allowing you decant the starter wort prior to pitching. Decanting is required since the wort has been oxidized and fermented at a higher temperature than is optimal for most yeasts (75F-80F recommended). Though this temperature is excellent for yeast growth, it does not leave a very favorable flavor in the starter liquid. Our calculator will allow you to enter all of the vital statistics about your wort so that it can properly calculate the number of yeast cells you will require, the required volume of your starter wort and the volume of yeast slurry that you must pitch to meet your ideal pitching rate. Below is a side by side comparison of the number of yeast cells created in a 1.5L simple starter (no stir plate) and a 1.5L stir plate starter. The results may surprise you! As you can see from the above comparison, utilizing a stir plate you are able to increase by 100% the yeast growth with the same amount of starter wort while using the same amount of yeast pitched into said starter. Conversely, you can also create the same amount of yeast in a stir plate starter as you are able to with a simple starter, with nearly half the starter volume. The latter is of great interest to lager brewers who will routinely need to create very large starters to reach the proper pitching rate for their lager beers. Lagers will routinely require a 3L-4L stir plate starter. If you utilized a simple starter (no stir plate), you would be in the neighborhood of 6L to reach the proper pitching rate. Without an air lock or taking gravity readings, how can you tell if the yeast is actively working? Are there signs of fermentation I can look for in the early stages? With any starter you may or may not have a krausen. If you are using a stir plate you can visibly see the increase in yeast population, yes it is that profound. I take a gravity reading after 24-48 hours, to do this you really need to have a refractometer because you will only need a few drops of the wort. The only way to determine whether or not the starter is fermented out, is by taking a gravity reading. You can find quality refractometers on Ebay shipped to you for $35 or so. Your wort will transform to a creamy brown pastel. Also you will see it go through stages of bubbles rising and foam to no bubbles and no foam when it is done. I ferment mine out in about about 48 hours then chill. Is it really necessary to dump out (decant) most of the liquid from the starter? Is this done more when it’s a big (2L) starter? Also, is it just a matter of dumping most of the liquid out, swirling the yeast around, and then pitching it? Thanks, and a very good article. 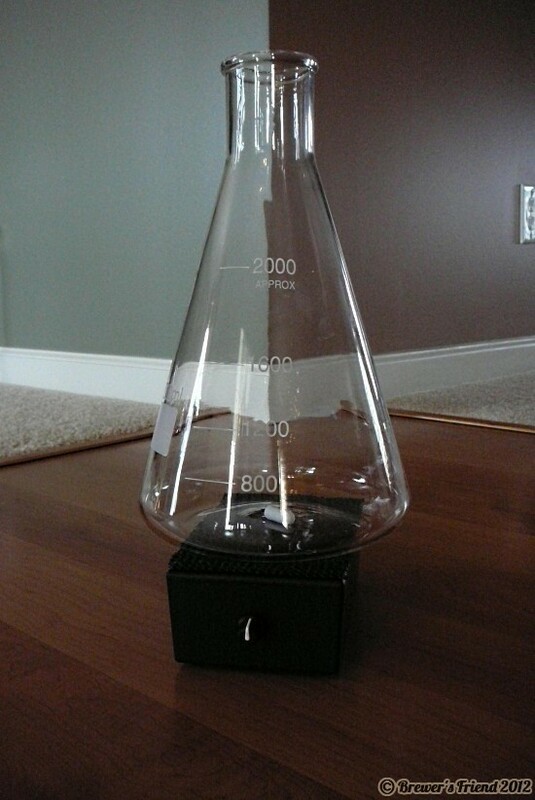 I got a stir plate today, by the way. Here’s to better beer! The reason for decanting is to minimize the flavor impact from the starer on your beer. Without decanting you are diluting the final product with unhopped wort made from DME (not so tasty). 2 liters is about half a gallon, which is about 10% of a 5 gallon batch. That means your IBU, color, and flavor are all dropping by that amount if you don’t decant. If the yeast in the starter has settled, I decant 80-90% of the fluid on top, swirl the yeast, then pour. If the starter is still cloudy and very active then I pour the whole thing in and say ‘what the heck’. It depends on how far along the starter is, but I try to start mine early so that I have the option of decanting. and ther is a green spotts on the bottom of the starter… it means that i my yeasts went bad?? Green spots are a very bad sign. I have never seen green spots in any of my starters. sorry i mistake the green spotted for places were no sediment where… color blindness?? anyone?? its a bad sign?? I’m not convinced this is okay, but if it tastes okay and smells okay, then it might be worth chancing it. Usually sediment covers the entire bottom. A new pack of yeast is cheap insurance for a healthy brew. What kind of beer was it you are culturing from? I happened across this page from a bread-yeast related search, quickly read the post, but haven’t read any of the rest of your site. Here’s my question: If you’re trying to grow yeast, why isn’t there a sterilized air (or O2) apparatus for continuous aeration? I’m sure I read somewhere that aeration was part of the Vienna Process, which was itself created by a brewer back in 1840s or thereabouts. I watched a couple of videos of stir plates in action. Apparently they stir fast enough that it creates an air vortex that extends down to the bottom of the flask, thus aerating the mix. Sorry for asking a question that I self-answered. We also aerate the wort by shaking it to create bubbles, rocking it back and forth, or pumping oxygen into it. Wort generally does not need continuous aeration, but commercial breweries may use it to speed up fermentation or control quality. I have been following everyone’s replies and there have certainly been some great thoughts on this particular post! It is true that stir plates are an excellent tool for making a starter with a high yeast population but are not necessary to make a good starter. I have had great success with simply agitating the starter vessel every few hours and allowing the yeast to settle and decant right before pitching. What is most important is allowing air to get into the starter vessel, but not the nasty bacteria cells that happen to float in the ambient air and attach themselves to specks of dust that also float in the air. The solution to this is a special foam stopper that comes with most yeast starter kits and are commonly sold in brewing stores and catalogs. This special foam has a microscopic structure that allows the exchange of crucial oxygen and released CO2 in the starter vessel as is agitated while still keeping out bacteria and wild airbone yeast. I have access to 0.2um filters at work that we use for culturing cells. I have yet to use them, but I assume they also work great. To use them, you would just need a rubber stopper with a drilled hole and sanitary rubber tubing to hook up to the filter. This means to pour off the top without disturbing the sludge in the bottom.